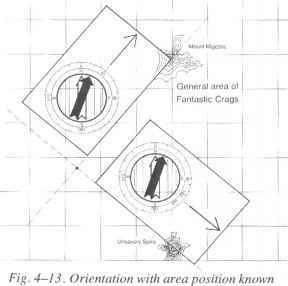 The climbers know their area position: they are in the general area of Fantastic Crags (fig. 4-13). They want to determine line position and then, from that, point position. To move from knowing area position to knowing point position, two trustworthy pieces of information are needed. The climbers may be able to use bearings on two visible features. They take a bearing on Mount Majestic and get a reading of 40 degrees. They plot a line on the map, through Mount Majestic, at 40 degrees. They know they must be somewhere on that bearing line, so they now have line position. They can also see Unsavory Spire. A bearing on the spire shows 130 degrees. They plot a line on the map, through Unsavory Spire, at 130 degrees. The two bearing lines intersect, and that's where they are.